Turning northwest along Interstate 110 northbound between Scotlandville and Baton Rouge Metro Airport (BTR). Photo taken 05/19/14. Interstate 110 winds north through Baton Rouge, joining I-10 with Downtown, the State Capitol and Baton Rouge Metropolitan Airport (BTR). 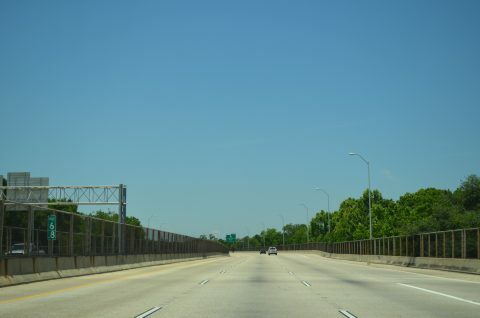 The urban spur provides a high speed route to U.S. 61 (Scenic Highway) leading north from Scotlandville in north Baton Rouge to southern Mississippi. The freeway carries six lanes north to Louisiana 19 (Scotland Avenue) and four lanes on the western leg to Scenic Highway. Speed limits are posted at 50 miles per hour on the substandard portion to the south and 60 miles per hour on the more linear stretches to the north. A four level interchange joins Interstate 110 with U.S. 61 & 190 (Airline Highway) east of the Mississippi River Bridge. U.S. 190 and I-110 form part of an incident detour for I-10 and the Horace Wilkinson Bridge. Initial construction for Interstate 110 took place by 1956 east of Capitol Lake and south of Memorial State. 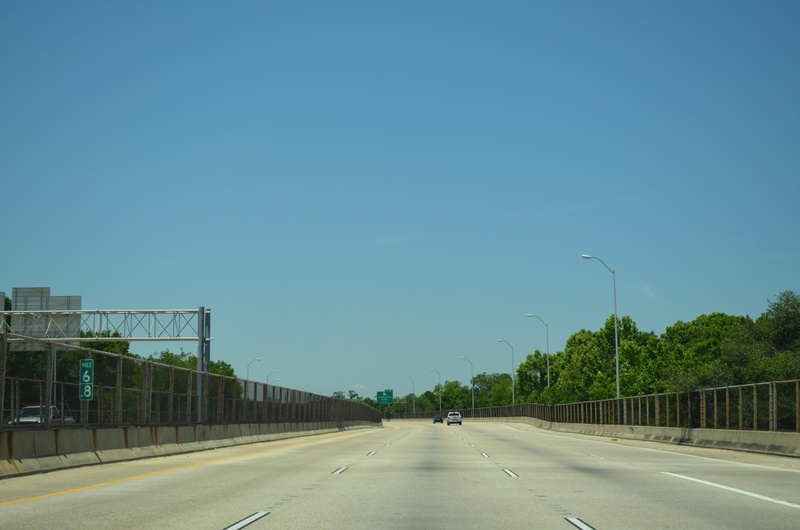 Named the Baton Rouge Expressway (Louisiana 3022), the short segment opened south to North Boulevard and north to Louisiana 67 (22nd Street) by 1961. The viaduct system south to Interstate 10 was completed by 1963, allowing a fast route from Downtown to the eastern suburbs and I-12. 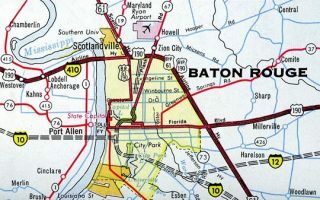 Early plans for Baton Rouge outlined a full loop north from Interstate 10 using a portion of U.S. 190 (Airline Highway) and the Mississippi River Bridge. This included a new terrain alignment from I-10 north to U.S. 190 at LA 1145, and an upgrade of U.S. 190 east to a trumpet interchange with I-410 leading south to the Baton Rouge Expressway. 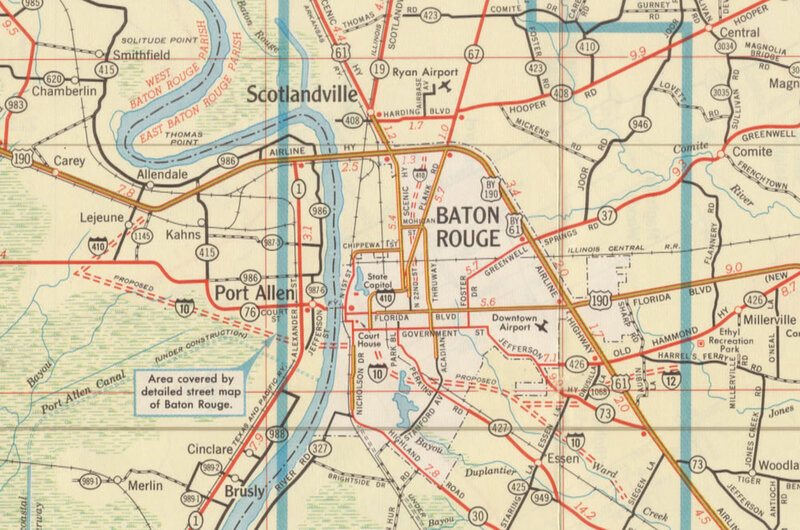 1961 Gousha map showing the projected path of Interstate 410 between I-10 and U.S. 190 (Airline Highway) in West Baton Rouge Parish. 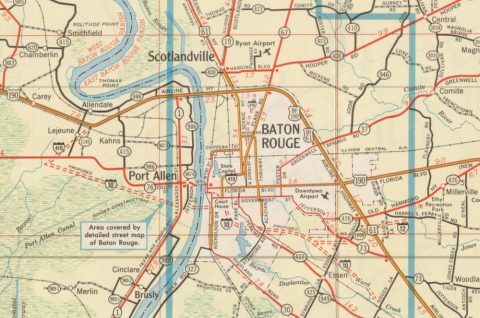 An Interstate 410 shield placed along U.S. 190 (Airline Highway) on early 1960s maps alluded to the freeway loop planned from Baton Rouge west to Lobdell. Extension of I-110 north to Airline Highway was completed by 1972. The freeway opened north from U.S. 61 & 190 to Harding Boulevard by 1978. The final link with U.S. 61 (Scenic Highway) was finished by 1984. The freeway was resigned again to use Clearview font by 2013. Interstate 110 turns west from the half diamond interchange (Exit 8A) with Louisiana 19 on the one mile approach to U.S. 61 (Scenic Highway). The freeway reduces from six to four lanes here. Photo taken 05/19/14. Leading west, I-110 passes though residential areas of Scotlandville to the two-wye interchange (Exits 8B/C) with U.S. 61 (Scenic Highway). Photo taken 05/19/14. A pair of end signs precede the ramp split for U.S. 61 (Scenic Highway) on I-110 north. Photo taken 01/05/09. U.S. 61 (Scenic Highway) angles southeast from Interstate 110 to Southern University and U.S. 190 (Airline Highway). North from Baton Rouge, the four-lane, divided highway continues to St. Francisville and Natchez, Mississippi. Photo taken 05/19/14. The Louisiana 19 off-ramp (Exit 8A) was originally designated Exit 8. Sign changes made by 2009 included a new sign bridge here for the state highway leading north to Baker. Photo taken 08/12/02. New signs installed along I-110 north at Exit 8A were carbon copied to use Clearview font by 2013. Photo taken 01/05/09. With the exception of exit renumbering, the U.S. 61 overheads posted at the viaduct end above Fletcher Williams Drive were carbon copied on sign replacements. Photo taken 08/12/02. This end sign was posted one quarter mile ahead of the northbound on-ramp to U.S. 61 (Scenic Highway) and the left-hand turn for U.S. 61 south. Photo taken 08/12/02. U.S. 61 travels another 38 miles within the Pelican State, to Wilkinson County, Mississippi. Photo taken 08/12/02. This shield assembly precedes the southbound split of Interstate 110 (Dr. Martin Luther King, Jr. Memorial Freeway) on U.S. 61 (Scenic Highway) at Scotlandville. Photo taken 05/19/14. Interstate 110 begins at a two-wye interchange with U.S. 61 (Scenic Highway) beyond this pedestrian bridge spanning Scenic Highway. Photo taken 05/19/14. Replaced guide sign for I-110 south on U.S. 61 (Scenic Highway) south at Scotlandville in north Baton Rouge. U.S. 61 meets the freeway again along side U.S. 190 on Airline Highway. Photo taken 10/13/03. The first sign for Interstate 10 (Exits 1I-J) appears along the Baton Rouge Expressway portion of I-110 south ahead of the Louisiana State Capitol. Photo taken 05/19/14. Exit 1A lowers from the I-110 viaduct to LA 73 (Government Street). The freeway continues south to the separation of Exits 1J for Lafayette and Exit 1I for the eastern suburbs, Interstate 12 and New Orleans. Photo taken 05/19/14. The exchange with Interstate 10 is often congested due to the sharp turn I-10 makes between the Horace Wilkinson Bridge approach to the west and the curve southeast toward Louisiana State University (LSU). Photo taken 05/19/14. 1.5 miles ahead of the I-10 on I-110 south by Memorial Stadium and the LA 3045 (Capitol Access Road) off-ramp (Exit 1E). Photo taken 01/05/09. The previous lane configuration for Interstate 110 south at I-10 allocated three lanes for eastbound. This changed in 2003 with the restriping of Exit 1I into two lanes. Photo taken 08/12/02. Guide signs installed in 2003 assigned exit numbers for Interstate 10. Photo taken 10/15/03. Interstate 110 defaulted onto I-10 east toward Gonzalez and New Orleans. A single lane ramp joined I-10 west ahead of Port Allen. Photo taken by Chris Patriarca (04/13/03). Interstate 10 westbound elevates on a system of viaducts from the Louise Street off-ramp (Exit 155C) to the split with Interstate 110 north (Exit 155B). I-110 connects I-10 west with U.S. 61-190 Business (Florida Street) to Mid-City. Photo taken 05/19/14. The westbound mainline of Interstate 10 bottlenecks to four overall lanes through the directional T interchange with Interstate 110. The freeway turns west to span the Mississippi River ahead of Port Allen. I-110 begins with a 50 mile per hour speed limit, navigating between Mid City and Downtown along a viaduct system. Photo taken 05/19/14. Coupled with a sharp curve and 35 mile per speed limit for trucks, the substandard ramps at I-110 north (Exit 155B) add to the routine congestion during peak hour traffic or during accidents, construction or severe weather. Photo taken 05/19/14. Photo taken 05/19/14. Four tenths of a mile south of Interstate 110 (Exit 155B) on I-10 west. The freeway spur represents the primary route to industrial facilities located along the Mississippi River, the State Capitol complex and Baton Rouge Metro Airport (BTR). Photo taken 08/12/02. 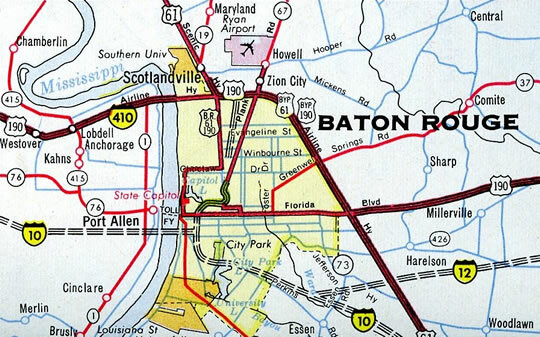 Older guide signs referenced Business District in place of Downtown Baton Rouge for Interstate 110 north. Vidcap taken 01/12/96. The Louisiana State Capitol appeared on the northern horizon as traffic separated for Interstate 10 west to the Horace Wilkinson Bridge and I-110 north to Downtown and Scotlandville. Photo taken 08/12/02. A third northbound lane opens for Interstate 110 north as I-10 west makes a 90 degree curve. These signs were replaced by 2003, and again by 2013. Photo taken 08/12/02. Interstate 10 ascends onto the Horace Wilkinson Bridge initially with two eastbound lanes. Flyover ramps from LA 1 at Port Allen expand the freeway east to three lanes to the left-hand ramp (Exit 155B) for Interstate 110 north in two miles. Photo taken 05/19/14. Exit 155A loops away from the east descent of the Horace Wilkinson Bridge to LA 30 (Nicholson Drive) and Highland Road southeast to Louisiana State University (LSU). Interstate 110 begins a half mile further. Photo taken 05/19/14. Interstate 10 turns south from the forthcoming directional T interchange (Exit 155B) and advances four miles to split with Interstate 12 east. I-110 winds north through the city to connect I-10 with U.S. 61 north. U.S. 61 reaches Natchez, Mississippi in 90 miles. Photo taken 05/19/14. Peak hour traffic congestion is a regular occurrence at Exit 155B due both to the lane drop for I-110 north and the sharp curve of the eastbound viaduct for Interstate 10 east. 2014 counts recorded by LADOTD showed 92,084 vpd along the I-10 mainline here and 19,528 vpd using the ramps to I-110 north and from I-110 south. Photo taken 05/19/14. A series of diagrammatic signs outlined the forthcoming lane drop for Interstate 110 north. Photo taken 01/15/06. Interstate 10 slowed on the one mile approach to Exit 155B and I-110 north. The freeway runs along the east side of Downtown, while LA 30 (Nicholson Drive) north from Exit 155A serves Downtown from I-10. Photo taken 01/15/06. An older sign bridge in use at the unmarked off-ramp for LA 30 (Exit 155A). New signs swapped out Business District for Downtown as the north control point for I-110. Photo taken 10/22/03. Interstate 10 begins a southerly course toward New Orleans from the south end of Interstate 110 in Baton Rouge. The freeway enters the New Orleans city limits in 75 miles. Photo taken 01/15/06.